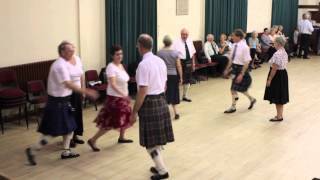 Added on: Aug. 24, 2014, 9:43 p.m.
RSCDS Nottingham Social Dance 2016-11-19 Elizabeth Gull Aug. 22, 2016, 8:44 a.m.
16 10 22 Hastings 2016-10-22 Chris Pratt Sept. 14, 2016, 9:10 p.m.
17 03 11 SASS Charity Ball 2017-03-11 Chris Pratt Jan. 8, 2017, 3:01 p.m.
Abingdon Club Summer Welcome Dance 2019-06-08 Angela Lawrence April 14, 2019, 3:30 p.m.
20180616 Pitlochry with David Oswald 2018-06-16 Kate Kinnear May 24, 2018, 12:41 a.m.
Tadley 2018-10-31 Great Scots! 2018-10-30 David McQuillan Sept. 23, 2018, 12:14 a.m.
Linlithgow SCDC 01 February 2019 2019-02-01 John Watkins Jan. 29, 2019, 1:39 p.m.
Tadley Scottish Country Dancers - Great Scots! 2018-10-30 V Gardner Sept. 19, 2018, 5:13 p.m.
Castle Club with Jim Lindsay 180217 2018-02-17 Kate Kinnear Jan. 4, 2018, 1:57 p.m.
Cambridg Scottish Society Summer Dance 2015-06-20 Roger Few June 20, 2015, 6:59 p.m.
Nantwich President's and Visitors' Night 2015-11-02 Christine Grove Aug. 28, 2015, 7:14 p.m.
18 06 23 Brighton & Hove at Moulsecoomb 2018-06-23 Chris Pratt May 13, 2018, 9:34 p.m.
CombertonVillageHall CB237DY with SilverCrossBand 2017-09-30 Matthew Goulden Sept. 30, 2017, 10:31 a.m.
Budapest Local Club 19.02.2019 2019-02-19 lldikó Szakolczai Feb. 20, 2019, 9:02 a.m.
West Derby St Andrew's Visitors Evening 2018 2018-11-26 Andrew Locke Nov. 13, 2018, 6:34 p.m.
Abingdon Class 25 March 2019-03-25 Sandra McLevy March 26, 2019, 9:04 p.m.
Stirling 2018-12-21 Hamish Gibb Dec. 20, 2018, 9:03 p.m.
Budapest Local Club 14.11.2017 2017-11-14 lldikó Szakolczai Dec. 5, 2017, 9:42 a.m.
Atholl SCDC Week 01 Brian`s Programme 18/09/18 Website:-www.athollscdc.co.uk/ 2018-09-18 Brian Martin Sept. 17, 2018, 3:20 p.m.
Wing Day School 2017-09-02 Sandra McLevy Aug. 23, 2017, 5:32 p.m.
Atholl SCDC Week 21 Margaret`s Programme 19/02/19 Website:-www.athollscdc.co.uk/ 2019-02-19 Brian Martin Jan. 24, 2019, 10:44 p.m.
R6122017 2017-12-06 Simon Stewart Dec. 5, 2017, 6:11 p.m.
Watford and West Herts Summer Social Dance - 21 June 2018 2018-06-21 Stuart Kreloff April 7, 2018, 8:31 a.m.
Thistle Club, Wing, Day School Evening Dance 17 2017-09-02 Jane Rose Sept. 2, 2017, 12:23 a.m.
RSCDS Wirral - Tuesday 24 November 2015 2015-11-24 Andrew Locke Nov. 22, 2015, 9:15 p.m.
Duddingston 21 February 2019 2019-02-22 John Watkins Feb. 16, 2019, 3:44 p.m.
15 07 04 Brighton and Hove 2015-07-04 Chris Pratt April 26, 2015, 10:27 p.m.
Alva 020818 J Lindsay 2018-08-02 Mary Cant July 28, 2018, 3:23 p.m.
Castle Club Alan Ross 2016-10-29 Kate Kinnear Oct. 24, 2016, 12:40 p.m.
Harpenden Highland Gathering 2018 2018-07-08 Julie Ross June 5, 2018, 2:29 p.m.
London Highland Club Dance 2016-04-02 Petula Allen April 1, 2016, 6:03 p.m.
20180419 - Budapest Minibal 2018-04-19 Zsofia Jozsef March 12, 2018, 7:12 a.m.
Linlithgow SCDC 22 February 2019 (Names) 2019-02-22 John Watkins Jan. 17, 2019, 1:14 p.m.
Chester Caledonian SCDS Xmas & Presidents Night 14 December 2013 2013-12-14 Anne MacDonald Dec. 7, 2013, 10:26 p.m.
Bookham 2013-07-06 Summer Dance 2013-07-06 David McQuillan May 22, 2013, 12:33 p.m.
15 10 03 Tunbridge Wells & Crowborough 2015-10-03 Maddy Coelho Sept. 25, 2015, 5:13 p.m.
Atholl SCDC Christmas Party - 20 December 2016-12-20 Joy Scott Nov. 9, 2016, 4:13 p.m.
Trinity SCD Club Edinburgh 2017/01/14 Alan Ross 2017-01-14 Daniel Hintermann Jan. 11, 2017, 2:38 p.m.
Richmond 27.02.19 2019-02-27 Simon Stewart Feb. 24, 2019, 11:41 a.m.
Joy's Programme - 2 May 2017-05-02 Joy Scott April 10, 2017, 10:26 p.m.
D170908 Sue Ronald Sept. 9, 2017, 10:27 a.m.
RSCDS Wirral - Xmas Dance 2015 2015-12-05 Andrew Locke Nov. 29, 2015, 7:09 p.m.
RSCDS Cheshire - Visitors' Night 8 April 2015 2015-04-08 Christine Grove March 1, 2015, 12:54 p.m.
2017-05-02 Atholl 2017-05-02 John Nuttall May 1, 2017, 9:56 a.m.
Bedford SDG 2015-10-11 Social 2015-10-11 Keith Rose Oct. 24, 2015, 5:25 p.m. Dancing &Walking Hols. Morecambe. Tuesday evening 17/11/15 2015-11-17 alan poh Nov. 13, 2015, 12:58 p.m.
Nantwich Bank of Demo Dances Christine Grove Dec. 21, 2014, 11:06 p.m.
RSCDS New York Branch October 20th 2016 Sue Ronald Oct. 18, 2016, 7:46 p.m.
Scotia 150810 Sue Ronald Aug. 7, 2015, 2:46 a.m.
HHK April 16 2019 2019-04-16 Sue Ronald April 13, 2019, 1:56 a.m.
Cherry Hill Jubilee Tea Dance 26.10.2014 2014-10-26 Randall Reale Oct. 22, 2014, 6:56 a.m.
15 03 14 SASS Charity Ball 2015-03-14 Chris Pratt Dec. 18, 2014, 5:31 p.m.
Scotia 150720 Sue Ronald July 20, 2015, 11:04 p.m.
Bedford SDG 2017-10-08 Social 2017-10-08 Keith Rose Aug. 20, 2017, 2:13 p.m.
Leicester Caledonian Society New Year's Dance - 7 Jan 2017 2017-01-07 Margaret Spence Jan. 8, 2017, 3:26 p.m.
Joanna's birthday dance 2019-01-19 Joan Blake Jan. 19, 2019, 3:43 p.m.
Silver Cross 190302 (Copy) 2019-03-02 Ken Martlew Feb. 28, 2019, 8:20 p.m.
Coupar Angus with James Coutts 180428 2018-04-28 Kate Kinnear April 2, 2018, 2:38 p.m.
Bookham 2017-07-01 Summer Dance 2017-07-01 David McQuillan June 8, 2017, 10:30 a.m.
Epping Forest Scottish Association Christmas Dance 2017 2017-12-16 Murrough Landon Dec. 16, 2017, 3:04 p.m.
Silver Cross 2-Mar-19 2019-03-02 Julie Ross March 2, 2019, 9:40 a.m.
Maidenhead 2017-10-15 Afternoon Tea Dance 2017-10-15 David McQuillan Sept. 5, 2017, 1:22 p.m.
Possible Entries 2018-2019v2 2019-06-20 Stuart Kreloff Feb. 25, 2019, 4:53 p.m.
Nantwich Ball with Lindsay Weir - Sat 21 March 2015 2015-03-21 Christine Grove July 25, 2014, 11:37 a.m.
19 03 09 SASS Charity Ball 2019-03-19 Chris Pratt Jan. 6, 2019, 2:58 p.m.
RSCDS Dundee 1st Foot 2015 Stella Phillips Nov. 12, 2014, 2:31 p.m.
16 04 23 SASS Boreham Street 2016-04-23 Chris Pratt Feb. 23, 2016, 4:04 p.m.
Trinity SCDC Edinburgh 2017/11/25 Matthew Maclennan 2017-11-25 Daniel Hintermann Nov. 13, 2017, 3:40 p.m.
Aberdeen, Craigiebuckler Church Hall - Friday 18 August 2017, 7:30 p.m. 2017-08-18 Brian Anderson Aug. 10, 2017, 9:26 p.m.
15 08 01 Goring 2015-08-01 Chris Pratt April 26, 2015, 11:13 p.m.
Watford & West Herts Centenary Caledonian Ball 2019 - 16 March 2019 (Copy1) 2019-03-16 Stuart Kreloff Jan. 13, 2019, 10:34 a.m.
Watford & West Herts Centenary Caledonian Ball 2019 - 16 March 2019 2019-03-16 Stuart Kreloff March 13, 2019, 10:37 p.m.
Hogmanay 2016 Jan Jones Aug. 5, 2016, 10:46 p.m.
20170713 - Alva Summer Dance 2017-07-13 Zsofia Jozsef July 4, 2017, 11:11 p.m.
Highland Club London Dance 2019-03-02 Iris Ronayne March 2, 2019, 6:27 p.m.
19 06 16 Strawberry Tea, Angmering 2019-06-16 Chris Pratt March 3, 2019, 1:25 p.m.
Possible Entries 2018-2019 2018-06-21 Stuart Kreloff April 3, 2018, 11:25 p.m.
LHC Burn's Night Sat. 7/11/17 2017-01-07 alan poh Jan. 7, 2017, 2:05 p.m.
15 04 11 Hastings 2015-04-11 Chris Pratt Feb. 27, 2015, 8:47 p.m.
Highland ~ 151003 Dance 2015-10-03 James Wilson Sept. 16, 2015, 11:04 a.m.
16 10 01 Tunbridge Wells & Crowborough 2016-10-01 Chris Pratt Sept. 14, 2016, 8:45 p.m.
Orpington BR51LA 7.30-11.00 to FRANK REID 2016-10-08 Matthew Goulden Oct. 8, 2016, 2:03 p.m.
18 04 14 Hastings 2018-04-14 Maddy Coelho Feb. 4, 2018, 8:59 p.m.
20180609 RSCDS Stirling with Nicol McLaren 2018-06-09 Kate Kinnear May 24, 2018, 12:20 a.m.
Trinity 120119 2019-01-12 Jim Armstrong Jan. 10, 2019, 9:59 a.m.
18 04 14 Hastings 2018-04-14 Chris Pratt Feb. 12, 2018, 1:44 p.m.
16 07 23 Goring 2016-07-23 Chris Pratt April 16, 2016, 5:56 p.m.
Sandbach Highland Ball - 11 April 2015 2015-04-11 Christine Grove March 3, 2015, 12:20 p.m.
Saint Quay Perros Ball 20170701 2017-01-08 Roland Telle March 22, 2017, 3:33 p.m.
Possible Entries 2019-2020v1 2019-06-20 Stuart Kreloff March 22, 2019, 9:21 p.m.
RSCDS Manchester Branch - Annual Dance 2017 2017-05-20 Helen Freer July 29, 2016, 10:16 a.m.
16 02 20 Cuckfield 2016-02-20 Chris Pratt Dec. 12, 2015, 3:38 p.m.
Matlock 2015 - evenings Truus de Ceuster Sept. 10, 2015, 2:17 p.m.
RSCDS Cheshire New Year Ball - Sat 11 Jan 2014 2014-01-11 Christine Grove Nov. 4, 2013, 4:38 p.m.
RSCDS Cheshire Ball 2013 Andrew Locke Dec. 9, 2012, 10:50 p.m.